Glacier Canyon and Dana Lake (photo by Beth Pratt)Under the watchful eye of Mt Dana, I wandered up Glacier Canyon to her namesake lake recently, and lunched below her glacier. I make sure to trek up to the Dana Glacier at least once a year, as it's slowly disappearing with the changing climate. 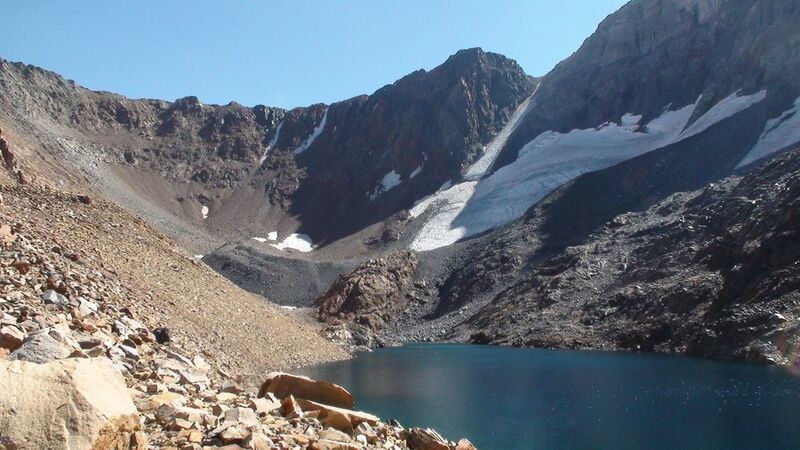 The remote, cerulean blue waters of Dana Lake provide a beautiful picnic spot, and the perfect place to contemplate the implications of a glacier slowly going extinct. During my hike I also encountered a very curious Pacific chorus frog, who kept gazing at me from his underwater perch, and found some recent bear tracks in the mud. The fresh paw prints brought to mind the wonderful Mary Oliver poem, Bear, that captures the emotion of seeing (or not seeing a bear) so well. An excerpt: "This is not my track, and this is an extremely/ large foot, I wonder /how large a body must be to make/ such a track, I am beginning to make/ bad jokes...."
For those of you interested in learning more about the plight of Yosemite's glaciers, check out the Alpine of the Americas project recent photo survey of the area or an article with photos and videos on KQED's Climate Watch.